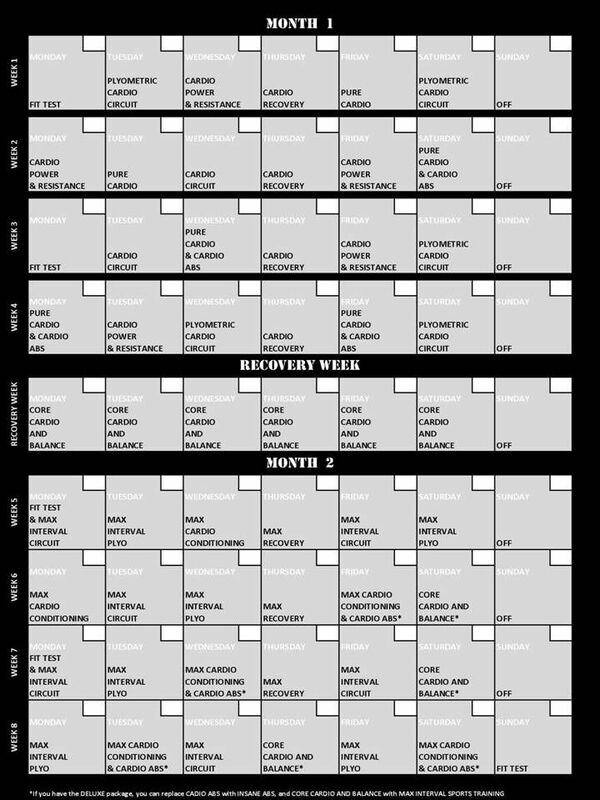 For those of you that, like I was, are debating if Insanity is right for you, I thought it would be useful to include the Insanity workout calendar in my blog so that you can check it out beforehand and see what this program entails. When I first saw this, all I could think about was that I would be working out (hard!) for six days a week. That seemed like it might be a problem coming from my previously sedentary lifestyle, but so far I haven’t had a single issue keeping up! Right-click, save-as for a printable image. That said, this workout isn’t for everyone. Most sources I have read say that you should already be in pretty decent shape before undertaking this program. Even Shaun T himself recommends in the ‘Dig Deeper’ intro that you consult with a physician before starting.Â However, I ignored all of this entirely and decided to take on Insanity from a beginners perspective, and aside from a bit of soreness for the first couple of days, I am doing fine. In the end, only you can decide. 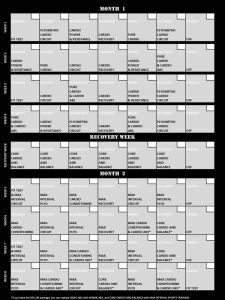 Check out the Insanity workout schedule below along with the details of the individual workouts and decide for yourself if you will be able to keep up with this program. *If you have the DELUXE package, you can replace CARDIO ABS with INSANE ABS, and CORE CARDIO & BALANCE with MAX INTERVAL SPORTS TRAINING. As always, feel free to contact me with any questions or comments and I will do my best to get back to you ASAP.